from the water during the offseason. (1) Develop the strength, power, and strength endurance of your upper body and core. Upper body pressing and pulling strength, power and strength endurance are the primary drivers of paddling performance during surfing. This program will help you develop the strength and endurance to do the paddling needed to ride more waves. (2) Train your paddling-specific work capacity/energy system (lungs and heart). Your lungs and heart are the drivers behind your paddling muscles, and must also be trained. We train these sport specifically during the pool sessions where you will increase your capacity and efficiency to perform in your element, water. (3) Increase your overall strength and durability. We understand the danger of surfing and other ocean sports. In our experience, stronger athletes are simply harder to injure. Increased strength alone – upper body and core – will make you more durable. This plan also specifically targets shoulder durability. These preliminary heats lasted 20 minutes each, and included several max paddling efforts of 1-20 second from surfers as they paddled to catch raves, or paddled back to the start zone after riding a wave. This plan acknowledges this study’s findings, and focuses on developing the paddling, work capacity, upper body strength and core strength needed by surfers to paddle out and catch waves. The goal is to have you paddling-fit when you get to the surf beach, so you can catch more waves, and surf longer before fatiguing. This is a progressive, very intense, 8-week, gym and pool-based training program. You will train 5 days/week for a total of 40 training sessions. The intention is that Monday, Tuesday, Wednesday, Thursday and Friday are are training days. Saturday and Sunday are rest days. 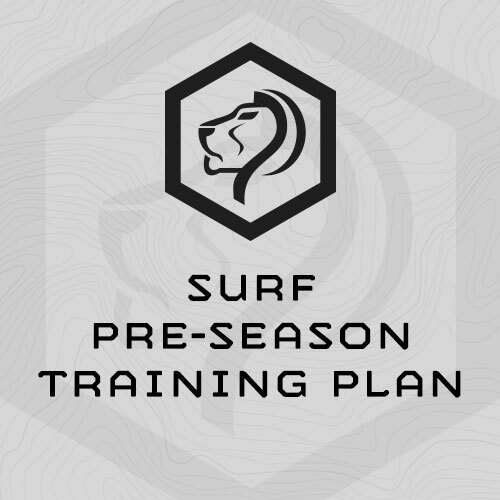 This program is designed to be completed the 8 weeks prior to getting into the surf. The first 2 weeks of this program are designed to build a level of base fitness through general, gym-based strength and conditioning. The following 6 weeks combine sport specific (paddling) conditioning with a continued build of base fitness. Each Monday during this program, you will be undergoing progressive swimming sessions designed to improve your paddling work capacity and better your performance and efficiency in the water. You will progressively swim with your head over the water mimicking the position you would be in on a surf board. There is also an emphasis on swimming with a pull buoy (no legs) since using your legs is not an option when in the ocean on a surf board. Finally there is an underwater swim component designed to improve athletes durability during big wave rides when there is a risk factor of being held under water for long periods of time. Wednesday’s Pool Sessions are designed to train work capacity combining hard swim efforts with onland (out of water) exercises. Every Tuesday during this cycle you’ll train strength. Through this cycle you will progress through a pull up, push up, and back extension ladder to strengthen the upper body and core muscles associated with paddling on a surf board. Every Tuesday during this cycle you’ll train work capacity. Every Friday you’ll train stamina. Essentially, these sessions are to train recovery and the mental fitness and attitude stamina of the athlete. These are long sessions and either incorporate long runs, swims, or a combination of both. Throughout this program you will train durability targeting common issues associated with high volume paddling. You will perform soft tissue work, mobility/stretching, patterning exercises, and stabilizer muscle strengthening exercises to ensure proper functional movement of the shoulder girdle. Most training sessions are designed to be completed in 60-75 minutes. What if I can’t keep up the Monday, Tuesday, Wednesday, Thursday and Friday Training Schedule? Do not skip a training session. Rather, complete all the training sessions in succession. Whatever the schedule, always take two days a week, ideally together, as total rest. For this plan, Training Sessions 1, 6, 11, 16, 21, 26, 31, and 36 are Mondays. What if I can’t complete the exercises using the prescribed loads? Drop, or “scale” the load or load as necessary to meet the prescribed number of reps or intervals. For example, if the training session calls for 5x Mr. Spectacular’s at 25# dumbbells and these are to heavy for you, drop to 20# dumbbells – whatever is required, to get 5 reps.
What if I’ve never trained in a gym before? This training program is going to be quite an adventure in athletic training for you! Our strength training is built primarily around classic barbell exercises such as the front squat, dead lift, power clean, push press and bench press. These are not complicated exercises, but they can be awkward at first. If needed, you can seek exercise instruction from a local coach or personal trainer. You can also teach yourself these exercises by being patient, using lighter loads, and sticking with it. Practice helps! There are many web-based sites and resources to find information on performing these common exercises. You’re not helpless. Be resourceful. What about exercises unique to Mountain Athlete? This plan requires access to an olympic swimming pool. The only gym-based equipment needed to complete this program not common in commercial gyms is a sandbag. Male athletes will need a 60# sandbag, female athletes a 40# sandbag. Sandbags can be made from duffle bags, old army gear bags, or purchased through our online store. Be resourceful. Several of the training sessions call for kettlebells. If you don’t have access to kettlebells, don’t worry about it. Dumbbells can be used in place of kettlebells for all the prescribed exercises.